These LEGO® BrickHeadz™ 41622 Peter Venkman™ & Slimer™ construction characters are fun to build using colorful LEGO bricks that recreate all of their iconic details, including Venkman’s slime-covered uniform and detachable proton pack, plus Slimer’s big green grin and two hot dogs. The Peter Venkman™ & Slimer™ (41622) Lego set is no longer directly available from the sites below. However, 3rd party partners of these sites might still have the set available. 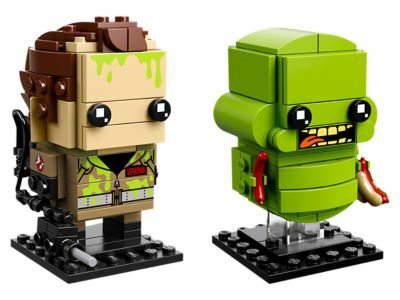 Alternate description Bust some ghosts with LEGO® BrickHeadz™ Peter Venkman™ & Slimer™! Buildable LEGO® BrickHeadz™ construction characters feature decorated eyes and authentic details from the blockbuster Ghostbusters™ movie, including Peter Venkman’s uniform and proton pack, plus Slimer’s hot dogs. Ghostbusters™ toys stand over 2” (7cm) tall without baseplate.